Two of Boris Werner’s friends, both musicians, were getting married, so for a unique gift he decided on a miniature stage setup with a Playmobil bride and groom as the guitarists. After some research and ordering quite a few parts, he was able to construct a festival-inspired scene, complete with guitars, lights, and some tunes. 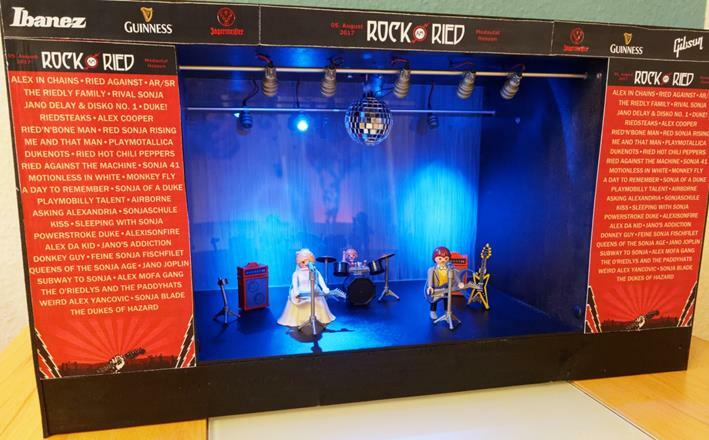 In order to bring this diorama to life, he used an Arduino Uno board to play WAV files from a micro SD card, along with NeoPixel rings in the background, and MOSFET-driven LEDs for stage lighting. There’s even a tiny disco ball that spins via a stepper motor, propelling the tiny bride, groom, and their young son as the drummer into the limelight. You can check it out in the video below, and see Werner’s series of posts on the construction here.